Teton was brought to the farm to keep the mice in check. But he turned out to be the kind of cat who kept all the animals in line. 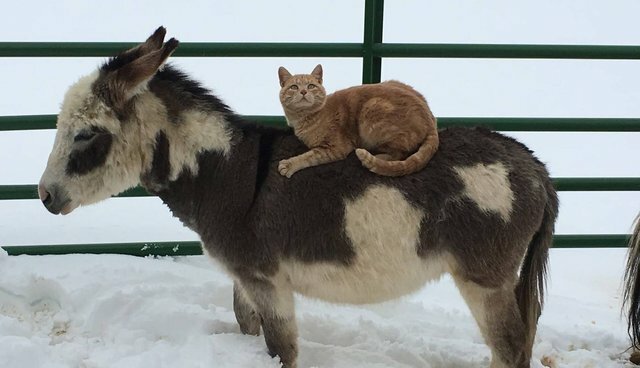 As a kitten, he was always roughhousing with animals monumentally bigger than him - the horses, miniature ponies, goats, even a miniature donkey. At just 3 months old, he ruled Joanna and Scott Shaw's farm in Elizabeth, Colorado, a 7-acre spread dubbed Snowfall Ranch. So much so, in fact, he often jumped on the animals' backs to better survey his kingdom. 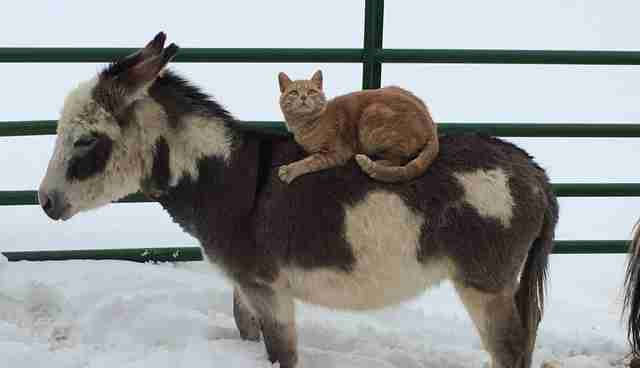 "We do see him on the miniature horses and donkey the most," Joanna Shaw tells The Dodo. 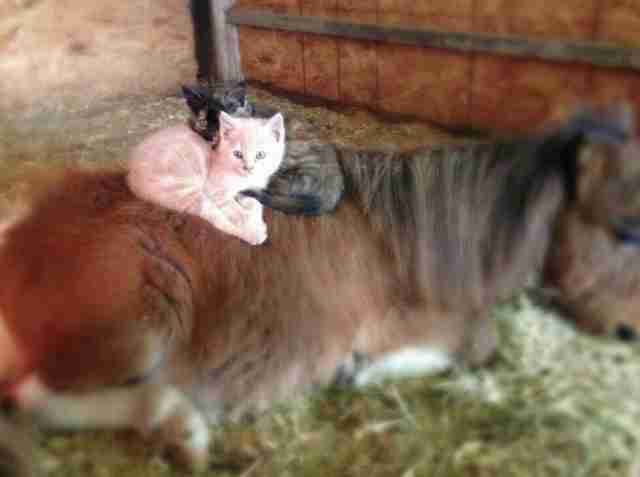 "He also sleeps in their stall with them." 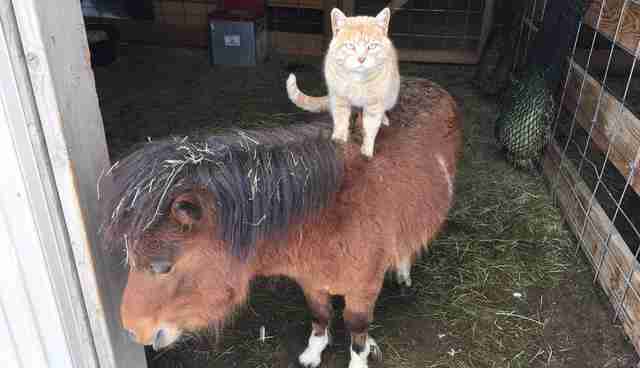 Teton first made headlines back in 2014 for his penchant for perching atop the other farm animals. Years later, Teton remains the undisputed ruler of the barn. At least until a snowstorm blows in. Then the mighty Teton turns into something of a scaredy-cat. "He tends to ride them more in snow with the belief being he doesn't want to get paws wet," Shaw explains. 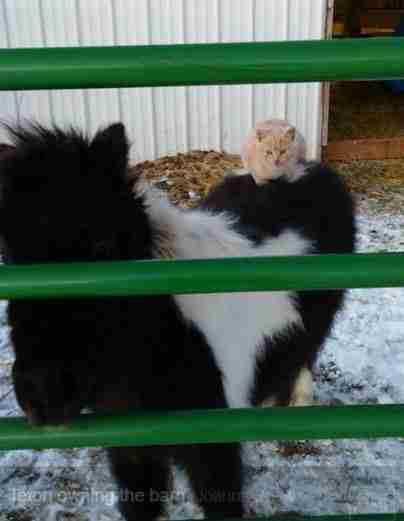 So when things get a little scary on the farm, this cat turns to friends in high places. But, it turns out, he's also become a fairweather friend to the other animals. "When they are turned out in pasture he goes with them," Shaw says. "He will lay with them on the 7 acres and I would guess he believes he is one of them."